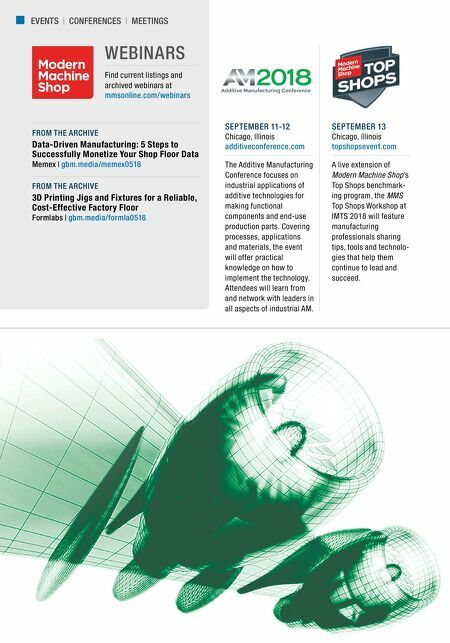 EVENTS | CONFERENCES | MEETINGS AUGUST 8-10 Wohlers Design for Additive Manufacturing Course Frisco, Colorado wohlersassociates.com AUGUST 28 Tarus Products Open House Sterling Heights, Michigan tarus.com SEPTEMBER 10-15 IMTS Chicago, Illinois imts.com SEPTEMBER 19-20 RM Forum 2018 Additive Manufacturing Milan, Italy eriseventi.com OCTOBER 5-9 PMPA National Technical Conference Rosemont, Illinois pmpa.org OCTOBER 9-13 BI-MU Milan, Italy bimu.it OCTOBER 10-11 Munich Technology Confer- ence on Additive Manufac- turing Munich, Germany oerlikon.com/mtc-event OCTOBER 10-12 Global Forecasting & Marketing Conference Indianapolis, Indiana amtonline.org/gfmc2018.htm OCTOBER 16-18 In(3D)ustry Barcelona, Spain in3dustry.com OCTOBER 23-25 Parts2Clean Stuttgart, Germany parts2clean.de OCTOBER 23-26 EuroBLECH 2018 Hannover, Germany euroblech.com OCTOBER 31 – NOVEMBER 1 Advanced Engineering UK Birmingham, United Kingdom thence.co.uk DECEMBER 4-8 Carbon Fiber San Diego, California CarbonFiberEvent.com Greenleaf Corporation, 18695 Greenleaf Drive, PO Box 1040, Saegertown, PA 16433-1040, United States | +1 814 763 2915 | sales@greenleafcorporation.com For more information, visit: www.greenleafcorporation.com/xsytin-1 Greenleaf Corporation is ISO 9001 Certified. See live demonstrations of our tooling in booth #338420. Take your aerospace machining to new heights. 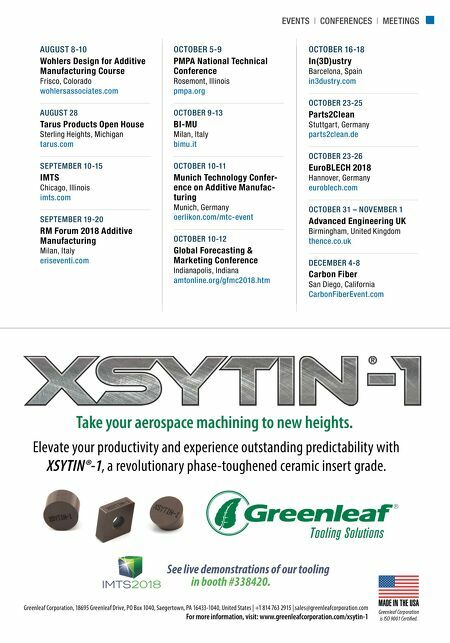 Elevate your productivity and experience outstanding predictability with XSYTIN®-1 , a revolutionary phase-toughened ceramic insert grade.